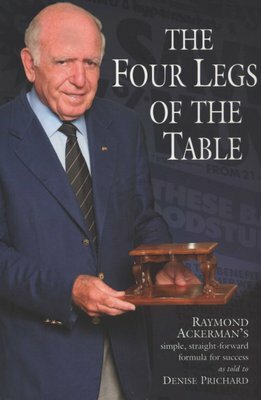 The four legs of the table is a master class in the balanced management style and system of 'the four legs' – Administration, merchandise, promotions / social responsibility, people – with the sovereign consumer on top of the table. It is a lesson on how to run a successful business based on consumer sovereignty and the principle that making money is the reward rather than the reason today. 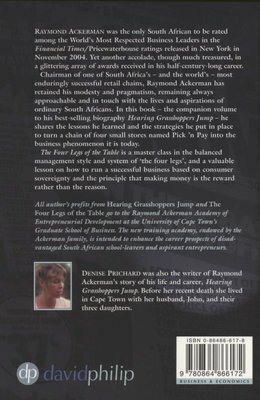 Ackerman built his retail chain during and after apartheid, and he stands his ground on the question of ethics - he believes it is possible to hold to a set of business principles and still be financially successful, whatever the circumstances. In an age of corporate greed, The Four Legs of the Table is a welcome antidote to some of capitalism's spectacular failures. All royalties from Hearing grasshoppers jump and the four legs of the table go to the Raymond Ackerman academy of entrepreneurial development. The Academy, endowed by the Ackerman family, is intended to enhance the career prospects of disadvantaged South African school–leavers.